These little darlings are something you can mix up in bulk and freeze in advance. They take a tiny bit of time, and can be a little icky to prepare (especially if you don’t like handling raw meat), but are totally worth it. These meatballs can be made as large or as small as you like and you may use any ground meat you happen to have,. 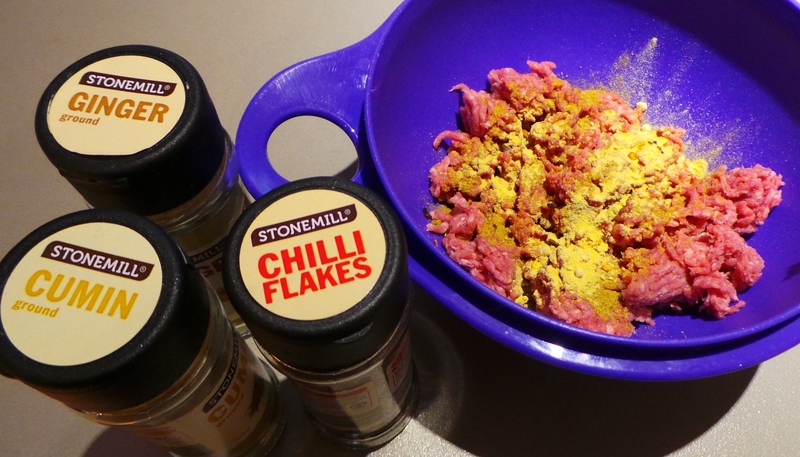 I developed this with chicken mince – mostly because I am not a fan of chicken. This recipe can be doubled, tripled, or even quadrupled if you want. You might even want to enslave, exploit, encourage your children to help roll them once they’re mixed. 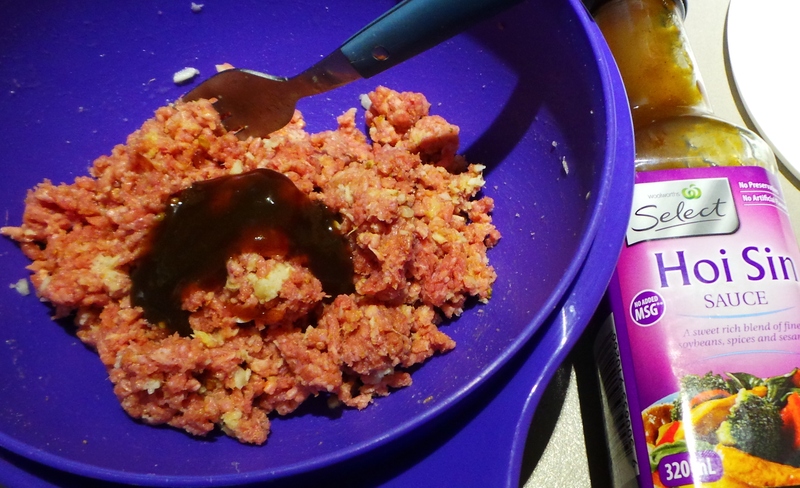 Dump your minced/ground meat into a suitable bowl. 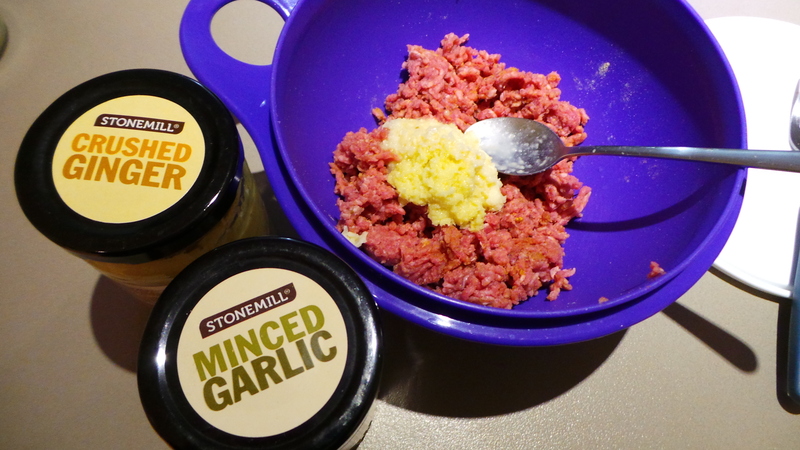 Then add a good spoonful each of minced garlic and crushed ginger. I always have little jars of those two things in my refrigerator. However, you can use fresh if you prefer. Add some aromatics to your meat. Mix through thoroughly. You may want to use a fork for this to help you break up the meat properly and distribute the flavourings more evenly. Then add a good shaking of whatever spices you think you’d like. My standards are ground cumin, ground coriander and a few chilli flakes – you may like to use a garam masala, or add ground ginger as well; finely chopped parsley or coriander/cilantro also make good additions. Go for it. Use what you know you like. Mix that through. You don’t need to be gentle, in fact being a little on the rough side will help to develop the proteins in the meat and make it all stick together better. You can skip this next step if you wish, but you might like to add a generous glug of an Asian-style sauce. As you can see, I used hoi sin for this batch. You could use teriyaki, soy sauce, kecap manis, oyster sauce or even sweet chilli sauce if you want. Or none at all – it’s not necessary but it does show what can be done. Mix through with the fork again, and then give it a good stir with a spoon or spatula. You’ll notice it all start coming together nicely. Now, with wet hands, create mandarin-sized balls of meat – wet your hands between meat balls and it will go easier. The wetness helps stop the meat from sticking. You may wish to wear disposable gloves. You may even find it easier to use a large ice cream scoop to measure them out onto a plate all at once and to just finish them off in your hands. Do what you feel comfortable with. You can freeze them at this point, if you wish. If you want to eat them now, then gently heat a pan or griddle that has been lightly brushed or sprayed with oil. Then add your meat balls, pressing down lightly to flatten them slightly. Set a timer for 4 mins and then LEAVE THEM ALONE. Just let them cook while you do other things, like set the table or something. At the four minute mark, turn them over. They should lift easily. If they stick, let them sit a minute or so more and try again. Set your timer for another 4 minutes. When the timer goes off for the second time they’re ready to serve. 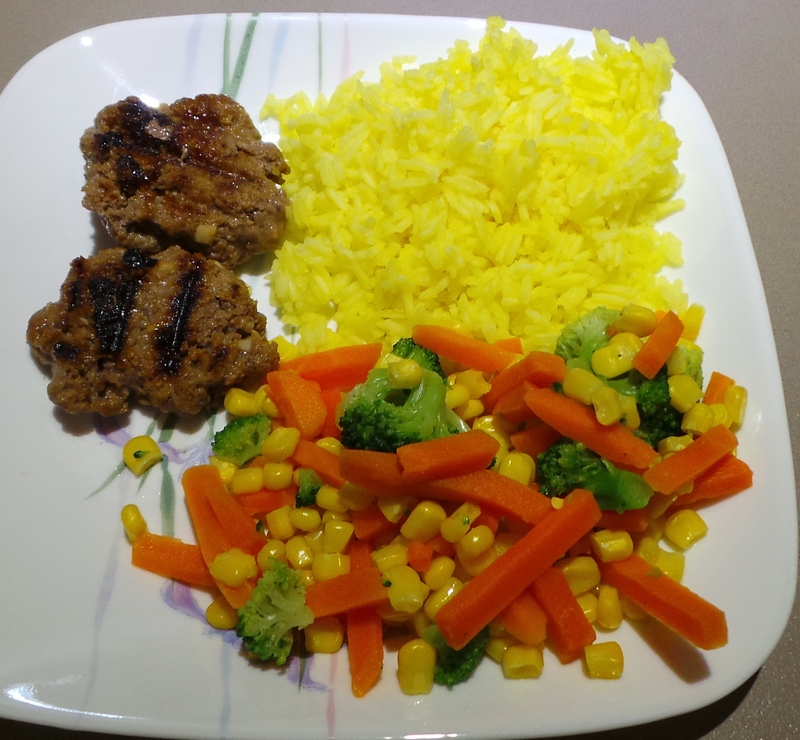 I like to serve with steamed rice and veggies. In this instance, I’ve tinted the rice with a touch of turmeric in the water. Make a meal out of it. They are also quite nice served as a burger. Place meat into a medium bowl. Add garlic and ginger and mix in well with a fork. Add sauce if wished and mix well. Mix until the meat starts to stick together and form a large ball. 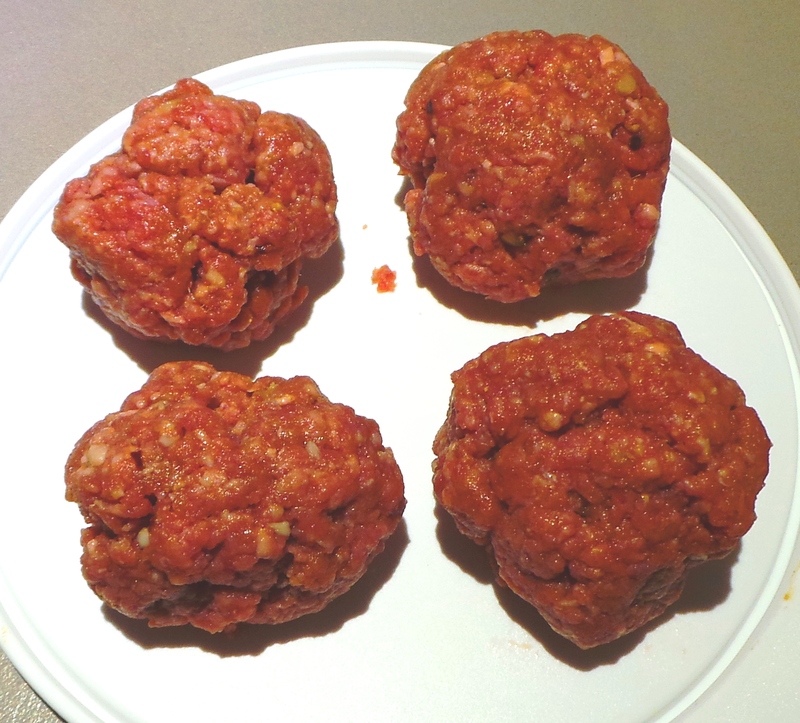 With wet hands, form into four meatballs (for this amount of meat.) If you prefer, use a large ice cream scoop to measure out and finish forming them in hands using disposable gloves. 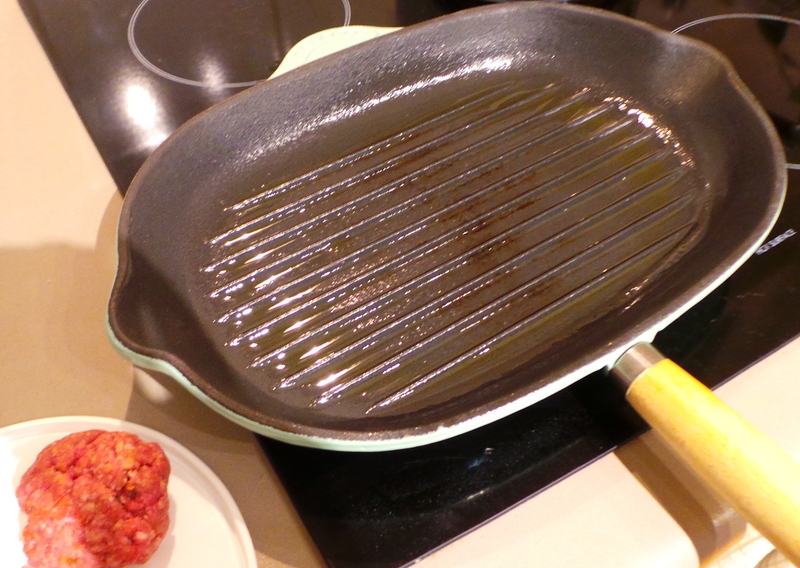 Heat a frying pan or griddle over medium heat and oil lightly. An oil spray would be ideal. 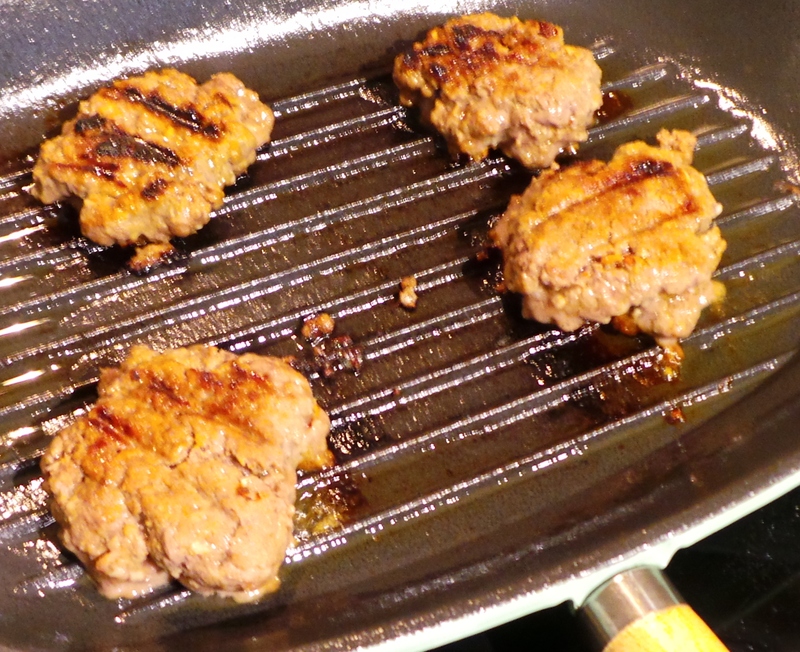 When the pan is hot, add the meatballs – pressing lightly to flatten slightly. Do not crowd the pan. Leave to cook for 4 mins. Turn and cook the other side for a further 4 mins. Cover a dinner plate with grease proof paper, such as baking parchment, and place meatballs on it so that they are not touching. Put the dinner plate into the freezer for 30 mins. There is no need to cover the plate. After 30 mins, remove the meatballs to a ziploc bag. Seal and return to freezer. By partially freezing the balls you will ensure that they won’t stick together in the bag. This means you can remove just the number you need. Ensure they are fully defrosted before cooking.